"Something bunny is going on..."
Tottington Hall's Giant Vegetable Competition is coming up and everybody's gardening reputation will soon be on the line. Wallace and Gromit are making a good living with their Anti-Pesto business, keeping people's yards rabbit-free. In fact, they're so successful they've run out of space to store the rabbits. Wallace has an idea: he'll combine his new Mind Manipulation-O-Matic with his Bun-Vac 6000 and brainwash the bunnies to hate vegetables as much as he does. It's a great plan--until he kicks the wrong lever. Now all the gardens are being destroyed, and the vicar has been terrorized by a horrifying beast! 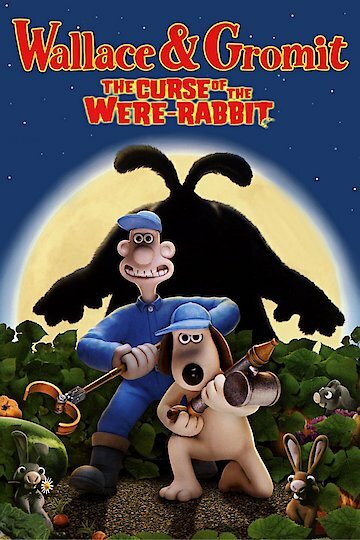 Wallace & Gromit: The Curse of the Were-Rabbit is currently available to watch and stream, buy on demand at Amazon, Vudu, Google Play, YouTube VOD online.